Sir Robert Peel (February 05, 1788 – July 02, 1850) was a British Conservative Statesman who in 1829 established the Metropolitan Police Force for London based at Scotland Yard. Peel became widely known for his Police reform efforts. Peel established nine principles by which his reformed Police would operate. 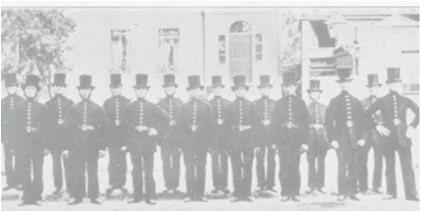 The reformed Police became known as “Peelers” or “Bobbies” which they are still called today. Modern Law Enforcement in America can trace its roots to many of the standards set by Peel’s reforms in the 19th Century. As a voice from the past we remind ourselves of the standards to which Police were expected to perform. We find that Peel’s principles have stood the test of time and can still be used to measure Police performance today. 2. The ability of the police to perform their duties is dependent upon public approval of police actions. 3. Police must secure the willing cooperation of the public in voluntary observance of the law to be able to secure and maintain the respect of the public. 5. Police see and preserve public favor not by catering to public opinion but by constantly demonstrating absolute impartial service to the law. 6. Police use physical force to the extent necessary to secure observance of the law or to restore order only when the exercise of persuasion, advice and warning is found to be insufficient. 7. Police, at all times, should maintain a relationship with the public that gives reality to the historic tradition that the police are the public and the public are the police; the police being only members of the public who are paid to give full-time attention to duties which are incumbent on every citizen in the interests of community welfare and existence. 8. Police should always direct their action strictly towards their functions and never appear to usurp the powers of the judiciary.